Learn more about how cats fit in to different families and get along with all kinds of people, including babies, children and pregnant women. Cats are wonderful pets. In a remarkably short space of time they become a core part of our families, bringing us laughter, affection and companionship. But did you know that cat owners are less likely to suffer from stress and are known to relax more and have greater life satisfaction? Cats keep their owners feeling young and active, and learning to care for a cat is great for a child's self-esteem, social skills and sense of responsibility. While some cats are naturally shy and a little cautious around new people, most cats will happily integrate into your family and get along well with all age groups. Your cat's ancestor is the African wildcat that typically live alone. So while cats can live in harmony with other cats, it isn't a natural behaviour and they may need a little help, understanding and encouragement to learn to tolerate another cat's presence in their territory. Dogs often get along well with cats, but we recommend that you introduce cats and dogs slowly, using a controlled process. It's much easier to introduce cats and dogs gradually than it is to repair a damaged relationship. First impressions are critical! Are you allergic to cats? You may find that you are only allergic to some cats, but not others. 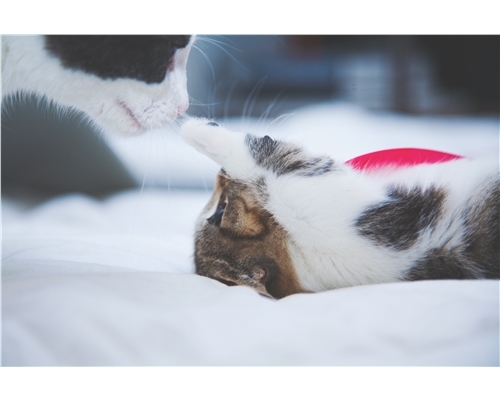 Alternatively, what seems to be a cat allergy may be connected to something else in the environment, such as dust mites, so before you re-home your cat, spend some time away from your cat first so you can rule out other factors. If you are mildly allergic to cats, you may also find that your symptoms fade over time, with repeated exposure to the same cat. If you want to get a cat, but aren't sure if you are allergic, try visiting a friend who has a cat, or a rescue centre, to see if the cats trigger your allergic reaction. Your cat can be a calming influence during pregnancy. When your baby arrives, you'll probably have less time for your cat, so it can be useful to start preparing for this moment so that you and your cat are ready. Toxoplasmosis is a micro-organism typically spread through soil, unwashed fruit and vegetables and under-cooked meat. While a study in the British Medical Journal concluded that contact with cats was not a major risk factor for toxoplasma infection, pregnant women should take care when cleaning litter trays. You should wear gloves and an apron when handling litter trays - or get someone else to clean litter trays while you are pregnant.